St. Aidan's Comprehensive School was honoured to be invited and attend a very special National Event along with three hundred schools, a special ceremony celebrating the Irish flag. 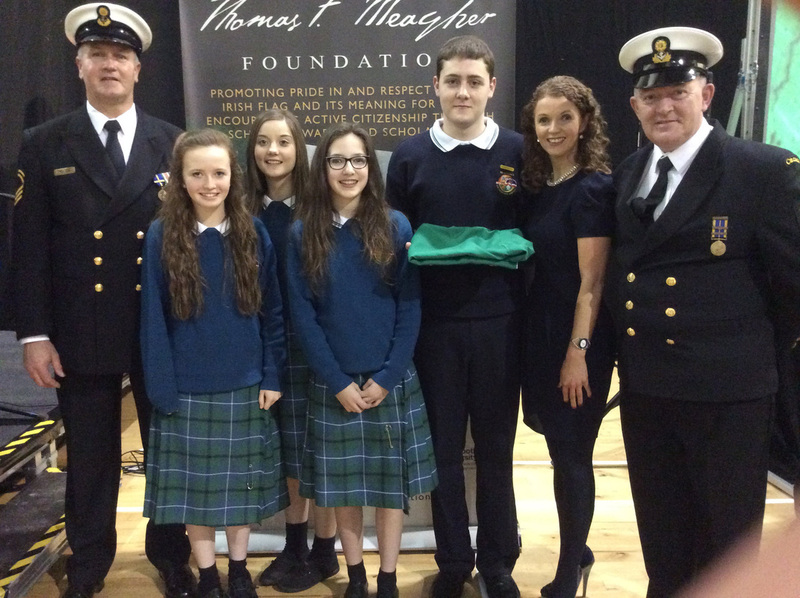 The event, organised by the Thomas F. Meagher Foundation, took place in Waterford City, on Thursday 12th March. 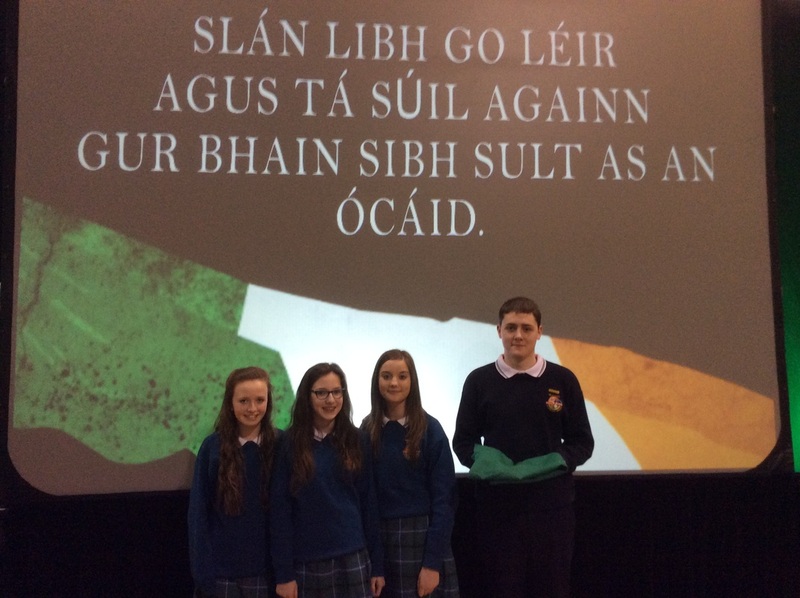 Each school was presented with an Irish Flag. 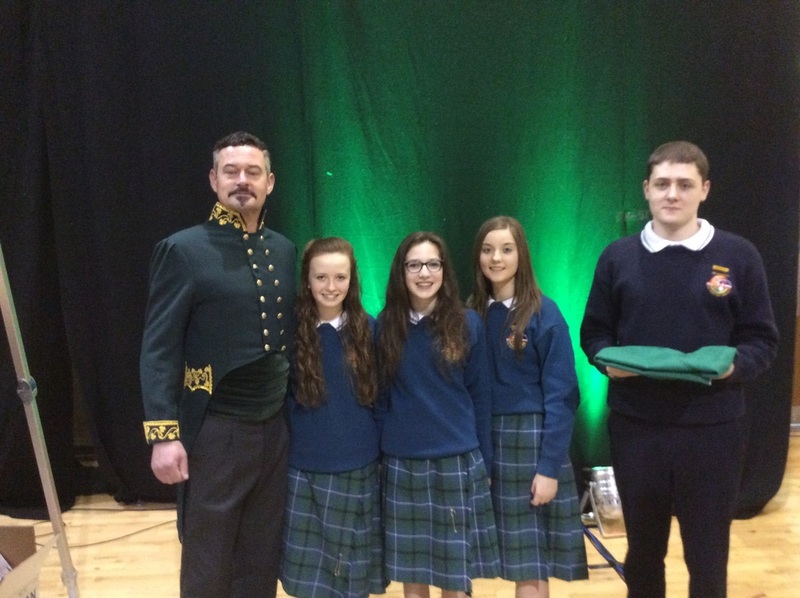 Ms. Ní Bhaoill along with four prefects, Shona McGahan, Claire McCaul, Amy Garland. Kevin Cosgrove accepted a flag on behalf of St. Aidan's. Thomas Francis Meagher was the man responsible for designing the Irish tricolour. It was first flown at 33 The Mall, Waterford, in 1848. Meagher, a Young Irelander, was exiled to Australia for his part in the 1848 Rebellion. Following escape, he travelled to the United States of America and became brigadier general of the Irish Brigade during the Civil War. In the aftermath of the war, Meagher was made acting governor general of Montana. 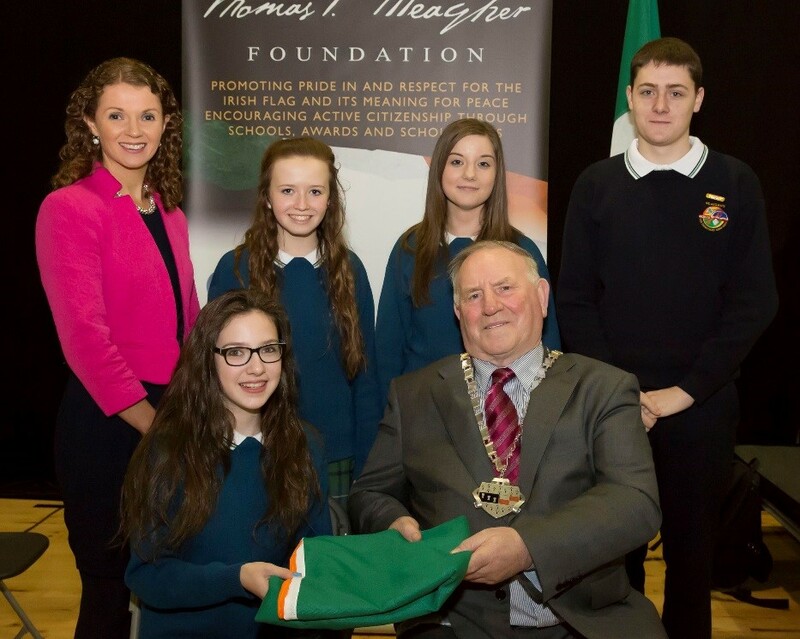 The purpose of the Thomas F. Meagher Foundation is to promote pride in and respect for the Irish flag. There was a great sense of occasion at this ceremony. The President of Ireland Michael D Higgins was guest of honour and spoke about the importance of citizenship, the symbolism of our national flag and its importance for each and every one of us. President Michael D. Higgins, noted that the flag is an emblem for peace and friendship. Mr. Higgins quoted Meagher as saying, ‘The white in the centre signified a lasting truce between orange and green. I trust that beneath its folds the hands of the Irish Catholic and the Irish Protestant may be clasped in generous and heroic brotherhood.’ The President also used the ceremony to launch the Foundation’s scholarship programme and to announce that there will be an Irish flag week in March 2016. 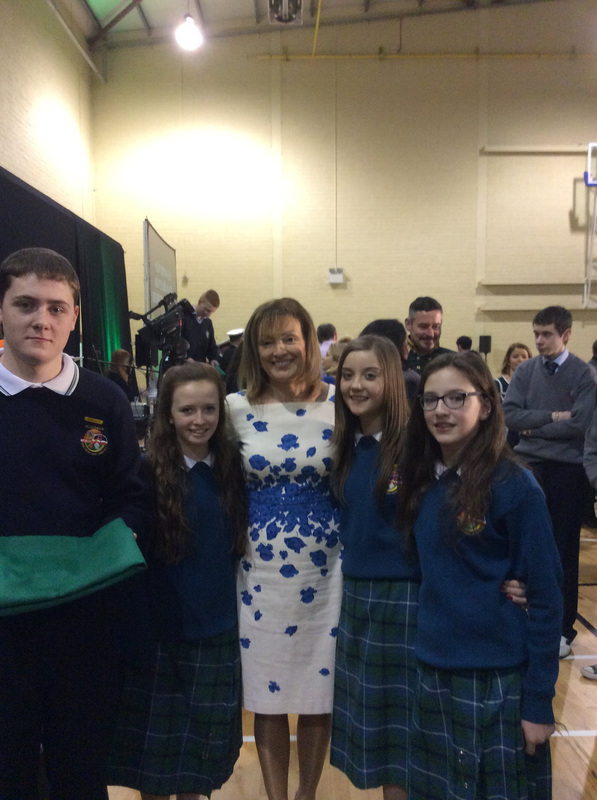 The St. Aidan's students enjoyed the ceremony immensely. Mary Kennedy from Nationwide was compeer for the event and warmed up the crowd with her usual good humour and an impromptu Mexican wave. The students got the obligatory photo with Mary at the end of the ceremony. Ireland’s Eurovision hopeful, Molly Sterling, performed her song ‘Playing with Numbers’. There was even a video message from Irish soccer international, Robbie Keane. With over 1,500 people in attendance, the ceremony was a tremendous success. 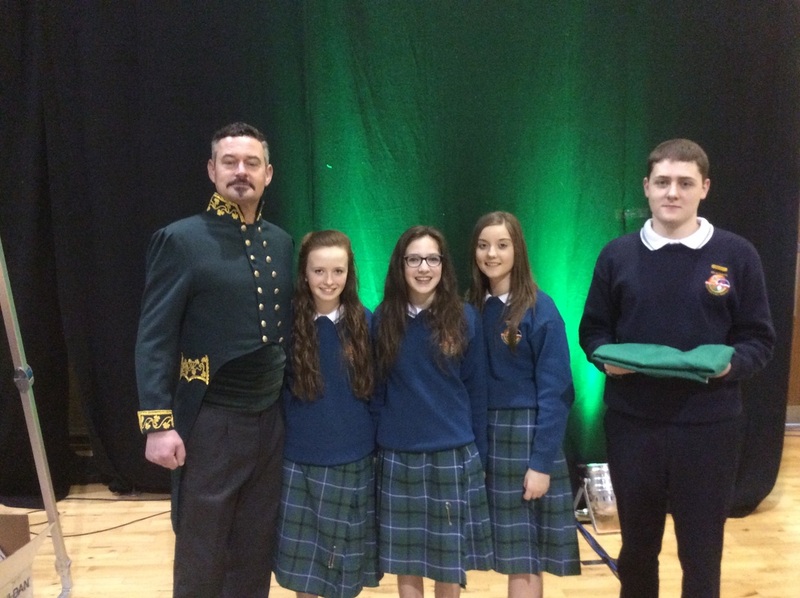 The event concluded with a strong performance of Amhrán na bhFiann from the audience. 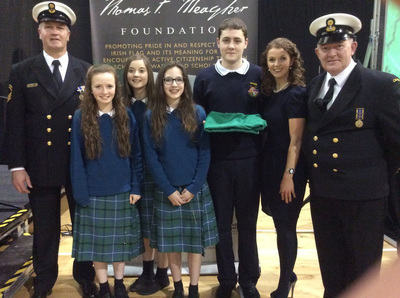 The Thomas F. Meagher Foundation is now well on the way to achieving its goal of presenting an Irish flag to every school in the country!